I stood there silently, solemnly, as one would before the grave of a dear friend. I was amazed by the beauty of her altar, the historical relevance of that place. To my left, a Michelangelo. To my right, a chapel of exquisite Lippi frescoes. Behind me, the Eternal City in all her glory — her pagan halls of worship turned temples of living faith. It was Holy Thursday, two years ago, in a familiar city. I was in Rome — a place I can happily call my home town. Nothing was different that day. This was a familiar place and I was a local. How many times before I had passed those doors en route to my favorite rooftop bar, or the espresso joint just a piazza away. This time, however, as I exited a cab, someone stopped me. Someone I knew from thousands of miles away. En route elsewhere, the suggestion was that I pause to pray to ‘his sister’. I did not understand. Praying to someone else’s sister is not my thing. 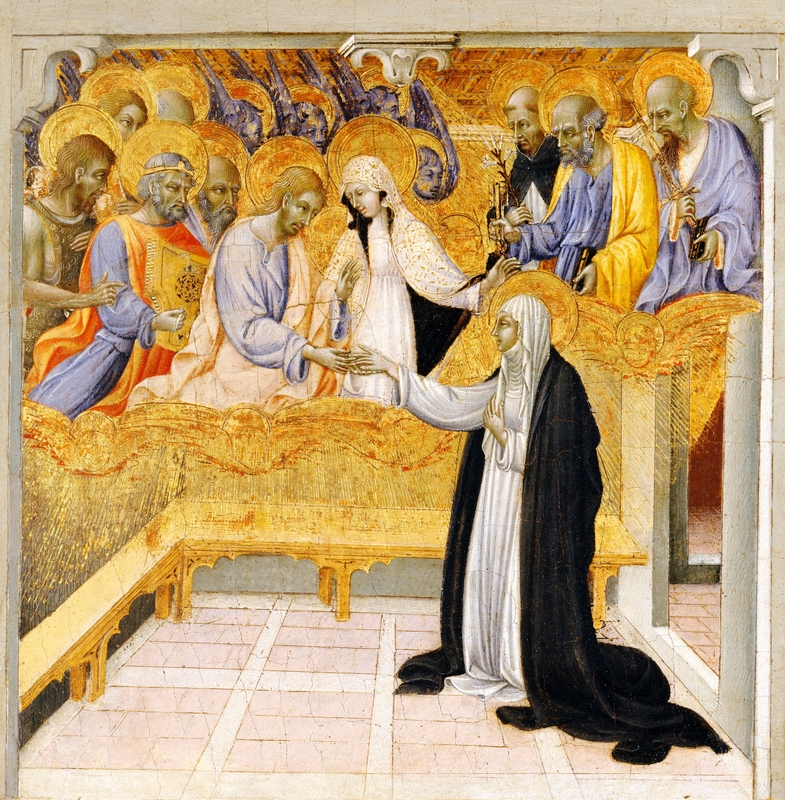 Until I realized the sister was St. Catherine of Siena, and the familial connection real. I would pause before her remains, intending a courtesy — a pass through visit. I stood there as a critic surveys a hall of art. The minutes lengthened. I began slowly to realize that the woman whose earthly relics were before me had been someone my age — a woman of daring faith and courage. A believer. A Saint. I found myself wondering why I was leaving all of Rome behind to remain before the relics of a woman, this woman, whose brief life had ended some six hundred years before. Rome, after all, is a burial ground. Centuries of blood stain the streets making the city a stunning sun slashed white stone grave land. Here, as Sigrid Undset famously remarked, even the parched dirt is holy — for it is drenched in the blood of martyrs. And yet, we traverse it as we trample any other arena ground of worldly glory, unphased. The people came by as divergent thoughts and the desire for great cappuccino’s distract. It is a procession of souls; one silent act of devotion after another. I watched them — moderns meeting the ever ancient new wonders of the life of grace before this altar tomb. Candles flicker — as numerous as the souls that pass her way. All roads seemed to lead here that day. I was struck by timeless faith, evident in the consumed marble steps at the feet of her altar. Thousands kneel before her and wear down the Roman stone with their prayers, their tears. Something strange took place here — strange to one who knew what all this was and yet had stood back to watch. I remained there, compelled to stay. A couple hours passed in this state of observation. In that time, heaven must have smiled. The Virgin of Siena and the little I could remember and would read of her life on my smartphone left an impression on me. A sisterly love undid the cold chill of distance and restored the filiation that I had doubted possible. And soon the sister was no longer an unintelligible figment of someone else’s pious devotion, but also mine — adopted. For in the Kingdom of God, sons and daughters are born in love that transcends human limitation. They are restored in grace, welcomed back from prodigal departures, assured of the homeland, received into a family. If only we dare believe. I had walked into that star-studded azure nave as a bewildered skeptic before a masterwork. Striking beauty surrounded me everywhere in that city, and yet I was left unmoved. What reason had You for creating man in such dignity? The inestimable love with which You saw Your creature in Yourself, and became enamored of him, for You created him through love, and destined him to be such that he might taste and enjoy Your Eternal Good. I see therefore that through his sin he lost this dignity in which You originally placed him, and by his rebellion against You, fell into a state of war with Your kindness, that is to say, we all became Your enemies. “Therefore, You, moved by that same fire of love with which You created him, willingly gave man a means of reconciliation, so that after the great rebellion into which he had fallen, there should come a great peace; and so You gave him the only-begotten Word, Your Son, to be the Mediator between us and You. He was our Justice, for He took on Himself all our offenses and injustices, and performed Your obedience, Eternal Father, which You imposed on Him, when You clothed Him with our humanity, our human nature and likeness. I left some time later unknowingly delighting in the masterworks of God. A month following I became a mother. This was her gift for the long-awaited visit. Life was yet again born of death. Such is the gift, the power of saintly intercession. I knew then why I had been diverted that morning, leaving the wonders of Rome behind that day to pay a courtesy call at her tomb. I had found the long unknown Sister someone else so loved and trusted. And she came through for me. The Fire had been lit; the door newly opened and a hand extended. I had crossed the threshold and left behind the cold world, with all its tempting glory yet deprived of God. That reunion had been desired in eternity by one whose dwelling is the Eternal City of paradise. Masterworks are God’s eternal way into the human heart. And they are called Saints. For being like us, yet in perfected union they know Him. And wish no longer. This is a sequel to a 2013 essay: The Doctor and Her Daughter.